Stuffed shrimp are so easy to make and are considered a quick and easy meal. While scallops are the original fast food, these don’t fall far behind. Use the largest shrimp you can afford. I prefer wild caught shrimp. What I have read about farm raised shrimp has me not eating shrimp for the most part. The process of farm raising shrimp is disgusting. I wouldn’t eat them for anything. Wild caught are another story. You need to know where the shrimp were caught. Additionally, you need be reasonably environmentally aware of what is going on the in the world so you can make your own decisions as to whether or not you want to eat fish from questionable areas. I still don’t trust seafood from the Gulf of Mexico or BP for that matter. I do not think the full truth has been disclosed about the Gulf disaster. Anyway, back to the shrimp. These are wild caught 16/20 white shrimp from eastern coast of Florida. We have a wonderful fish market in town called Clean Catch Fish Market. They procure only the best seafood from around the world. The prices reflect it too, but so well worth the cost. When I decided to write about stuffed shrimp, I needed the best shrimp I could find. There was only one place to go, Clean Catch. When buying shrimp, the numbers like 16/20 indicate how many of them are in a pound. 16/20 means there are between 16 and 20 in a pound. The smaller the number, the larger the shrimp. When you see a size like U-10 or U-15 it means Under 10 per pound or Under 15 per pound which means you are going to get a really big shrimp, almost lobster tail size. Note: Larger shrimp are easier to peel. If you are so inclined, save the shells for making shrimp stock. Freeze them until you have enough to run a batch. Smell the shrimp. They should smell like the fresh ocean, not ammonia, iodine or dead fish. Because only two of us were eating, I got 8 shrimp. No need to buy a full pound. For this dish, you will peel and devein and butterfly the shrimp. You will leave the first tail section and the tail on for presentation. Insert your sharp paring knife into the top portion of the shrimp and open the shrimp all the way to the first tail section. This makes shell removal simple, also opens the shrimp so you can remove the intestinal track. (Yup, that’s what that black line is along the back.) 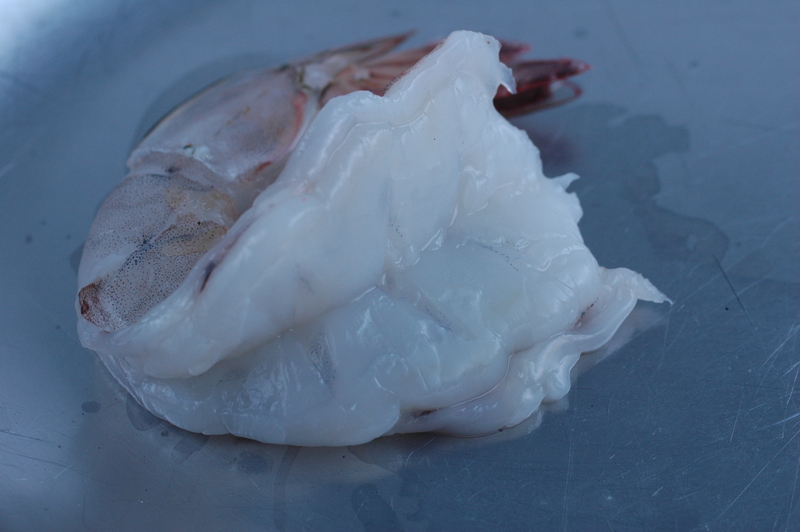 Cut deep so you can lay the shrimp flat, also known as “butterfly” the shrimp. Be careful not to cut all the way through. Rinse under clear cold water. Label and freeze shells for later use. Make the stuffing. Form into small balls that fit on the back of the shrimp. Fold the tail over the stuffing and spread or fan the tail out so it looks nice. 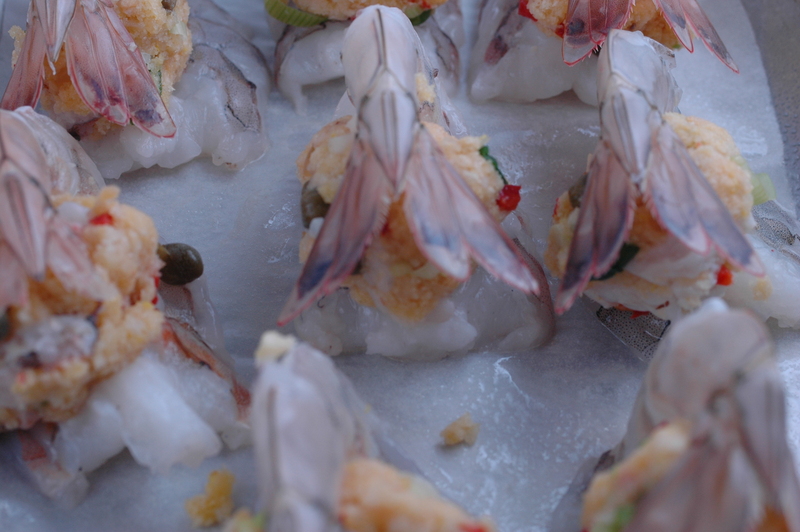 Place the shrimp on a baking sheet and bake in a 400°F oven for 10 minutes or until the shrimp turn pink. Remove from the oven and serve with Lemon Orange Horseradish Sauce and a nice salad on the side. This makes a generous amount. Freeze any left over so you can make stuffed shrimp again soon! Or use the stuffing in another seafood or in mushrooms or quail. Mix everything in a bowl. The mixture should hold together when you squeeze it. Make small balls of the stuffing mix and place a ball on the back of the shrimp and fold the tail over. Fan the tail. Bake at 400°F for 10 minutes or until the shrimp are pink. Super simple and versatile. This sauce goes well with these shrimp, coconut shrimp and spring rolls. Melt over low heat, whisk to incorporate. Bring to a boil and simmer for 2 minutes. If it gets too gloppy, add a small amount of water. Spoon the sauce around the shrimp on the plate and serve. This entry was posted in Recipes and tagged cook, Deveining, dinner, Fish and Seafood, fish market, Shellfish, Shrimp, stuffed shrimp. Bookmark the permalink. This looks fantastic! 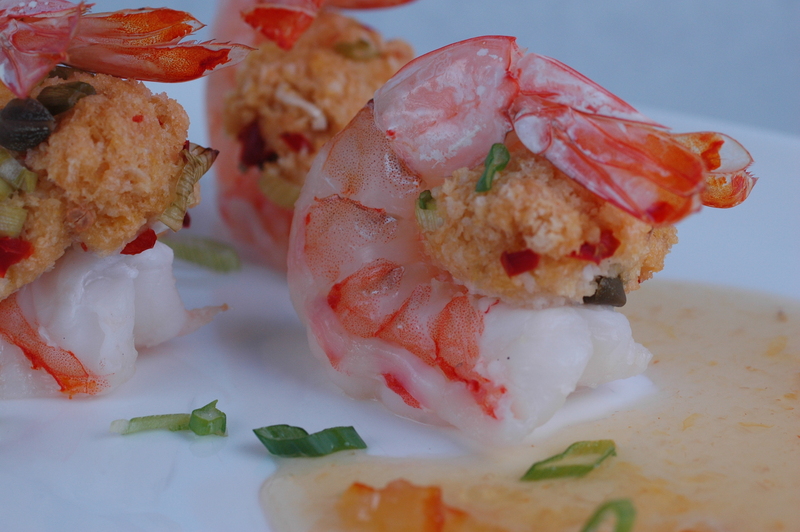 I’ve never heard of stuffed shrimp before, but this recipe looks like a must-eat. Great job! Thanks! Super easy too. Enjoy! Awesome recipe! And great pictures! Thanks for sharing! Thanks for stopping by and commenting! Hope you make them and they turn out well. They make great hors d’oeuvres too. So beautifully presented and so delicious. Thanks Mandy! I appreciate you stopping by. Sounds like you made them, Great! I hope you enjoyed them. 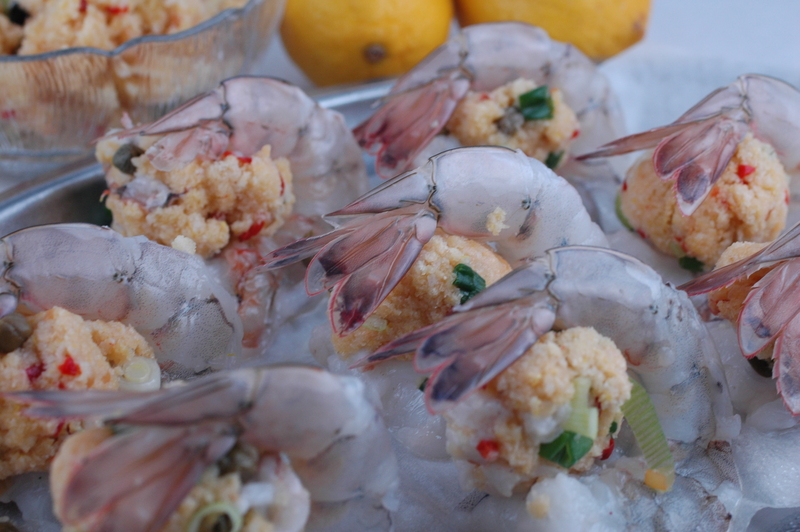 these shrimps look to die for and they are 5-star presented. should I call you chef? btw, how’s your book coming along? 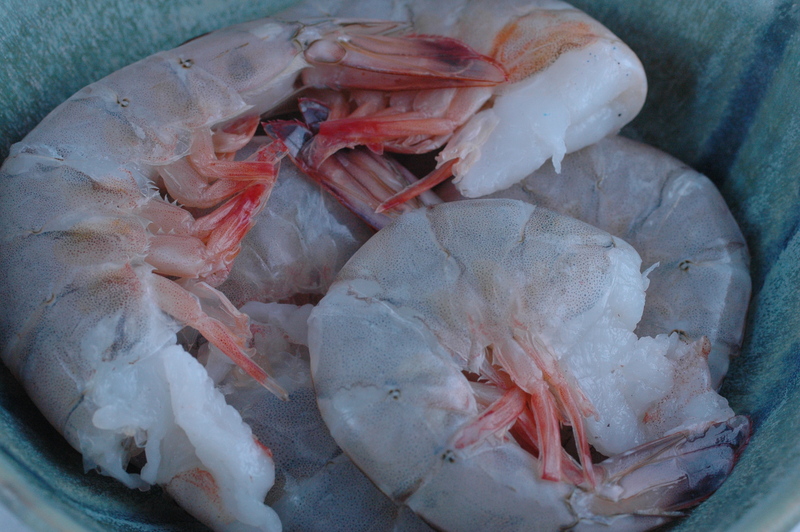 The farm raised shrimp are not environmentally friendly and contain all sorts of things you don’t want to eat. They do contain a high level of antibiotics due to how they are raised “on the farm”. If you are going to eat shrimp, best is wild caught. I can smell a farmed raised shrimp when it comes in the door. Foul. Lol, Barbara, I am a chef, I teach culinary school for a living; U\used to own my own restaurant and wine store too. The book is coming along OK, I keep changing my mind as to what to include. So I record and develop everything, which is not productive since the energy gets scattered and not focused.